With an aim to prevent diseases caused by worms, some 12 lakh students up to 18 years of age in Tripura will be administered Albendzol tablets at all Anganwadi centers and schools and junior colleges and diploma institutes, said the state Health and Family Welfare Minister Sudip Roy Barman. 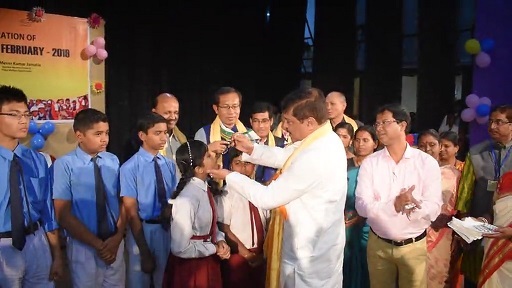 The Health Minister during a programme at the Khowai town hall inaugurated the state level National De-Worming Day February – 2019 and administered the medicine to few students. Others present at the programme were chief whip Kalyani Roy, MLA Dr Atul Debbarma, Nirmal Biswas, Prasanta Debbarma and official of the state health department. Under Rashtriya Bala Swastha Programme (RBSP), the deworming drive will be observed in all private and government educational institutions on Friday, the National Deworming Day. As part of this programme, all schools and ICDS would administer Albendazole tablets to children and adolescents aged between one to 18 years. A child not dewormed on National Deworming Day due to absenteeism or sickness will be dewormed on ‘mop-up day’ which would be observed on February 14. As per the World Health Organisation (WHO) data, more than 22 crore children in ages of 5- 14 years are at risk of helminth infection.